Introduction. 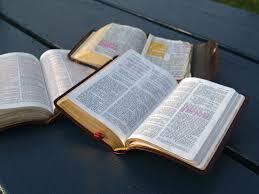 As a convenience to our visitors, we've included a number of links below to various Bible study aids on the Internet. We encourage your use of such aids to enhance your studies. CAUTION: Unlike the Bible, these aids were written by fallible, uninspired men. Do not blindly accept what they say - please diligently compare what they say with the Bible. Also note these links will take you to other websites not associated with Bible Questions. We cannot provide a blanket endorsement on everything you might read - please use caution and spiritual discernment when using these aids and the websites which host them. Each plan is arranged by "Weeks" to enable you to start the plan at anytime of the year with each week based on five days of reading. The plans are in downloadable PDF format. Genesis to Revelation (pdf). This plan covers the Bible from cover-to-cover in 52 weeks based on five days a week. Old and New Testament Daily (pdf). This plan covers a portion of the OT and NT each day. Both the OT and the NT are arranged in "normal" book order. Chronological (pdf). Based on best available information, this plan arranges readings in time order. Historical passages are ordered when the events occurred while other types of passages (e.g., law of Moses, wisdom literature, major/minor prophets, the letters of Paul/et.al.) are ordered when they were likely written. NT in 30 days (pdf). "I don't have time to read the Bible." According to a government survey for those age 15 and over, almost 3 hours per day average is spent watching TV. Could you reallocate one hour of that for 30 days to read the "Greatest Story Ever Told"? This plan covers the New Testament from start to finish in a month. People's New Testament Commentary. Barton Warren Johnson was considered to be an outstanding preacher, editor, and writer in the Restoration Movement during the Nineteenth Century. This commentary was produced in 1891 and is especially designed for the beginner. Jamieson, Fausset & Brown's Commentary. The commentaries of Robert Jamieson, A.R. Fausset & David Brown were originally published in 1871. "JFB" covers most verses in Old and New Testaments in a concise, yet useful manner. Albert Barnes' Commentary. This work was published in the mid-1800s. Matthew Henry's Complete Commentary on the Bible. Completed in 1706, this commentary treats every verse of the entire Bible. Some readers may find the lengthy discussion somewhat challenging to read. Nave's Topical Bible. This work was originally published in the early 1900s and consists of 20,000 plus topics and 100,000 references to the scriptures. Torrey's New Topical Textbook. Used in conjunction with Nave's Topical Bible, Torrey's work is a good tool. It is simple and easy to use. Just type in a keyword and Torrey's New Topical Textbook will present its findings in a topical presentation. Smith's Bible Dictionary. This acclaimed and classical work first introduced in the 1860s has over 4,500 subject entries. Easton's Bible Dictionary. This dictionary was written by Matthew George Easton, who lived from 1823-1894. It contains nearly 4,000 entries relating to the Bible. Despite its name, many of the entries in Easton's are encyclopedic in nature, though there are also short, dictionary-like entries. International Standard Bible Encyclopedia. Originally published in 1915 under the general editorship of James Orr, this work has almost 10,000 entries. Vine's Expository Dictionary of New Testament Words. With over 3400 entries, this timeless classic is a popular initial guide to New Testament Greek words for English readers. Based on the King James Version, each English word shows the associated Greek words and their meanings. Vine's fills the gap between the Bible in English and the original New Testament Greek. A. T. Robertson's Word Pictures of the New Testament. Dr. Robertson has made numerous Greek contributions to be used by the serious Bible student. His Word Pictures contains much useful material from a Greek language perspective. Online Study Bible. This website provides a number of searchable Bible translations, including the American Standard, New American Standard, New King James, and the Septuagint (Greek Old Testament).